The Slim 1TB Sony PS4 console is up for sale at a discounted price of Rs 31,290 and there’s an extra cashback of Rs 4,000 as well. It’s Friday and on almost every e-commerce site, you will see some gaming gadgets on sale. 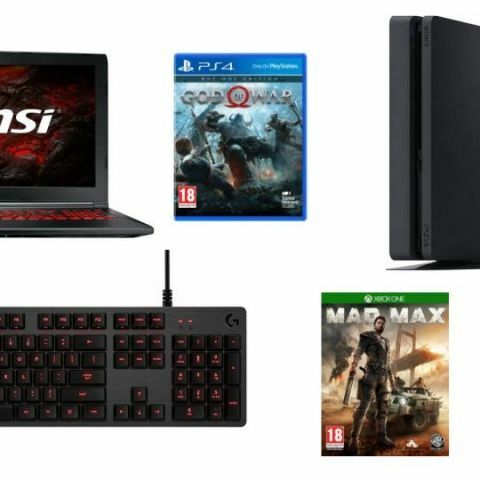 We have rounded up some of the best deals available across various online retailers in order to satiate the gamer within. The Dell Inspiron 5577 laptop is aimed at gamers with the 7th Gen Core i7 processor and 4GB Nvidia GTX 1050 GPU. It comes with 8GB DDR4 RAM, coupled with 1TB storage and features a 15.6-inch display. You can check it out here. The latest installation in God of War franchise needs no introduction to fans of the series. The game has received excellent reviews, from us as well and as we said, “When it comes to experiencing God of War, the story is deep, the gameplay is satisfying and the visuals are stunning. If you like games like Bloodborne, Dark Souls, DMC, and Horizon: Zero Dawn, then you should definitely give this one a go. You will be left wanting more.” Buy the title here. The slimmer PS4 console is not the latest but still in demand when. It is being offered with a 5 percent discount with the MRP, along with a hefty Rs 4,000 cashback. It supports HDR, remote play and share play as well. You can purchase the console here. The MSI gaming laptop is powered by the 7th Gen Core i7 processor, coupled with 8GB RAM and 1TB of HDD. It also sports 4GB Nvidia Geforce GTX 1050 Ti GDDR5 GPU and features a 15.6-inch display. You can buy the laptop here. Mad Max is a gaming title with a dystopian future in front and center. The protagonist gets meddled in the midst of survival and the game gives a good experience of this, borrowing it directly from the movie. You can buy the gaming title here. Bethesda has remade the legendary game with all the blood and gore one would expect, and then some. If you like mashing demons, along with the super bosses which drop-in from time to time, and showing off your shooting/slashing skills, you can buy the game at a highly discounted price here. The Logitech G102 is a decent entry-level gaming mouse, which comes with an adjustable optical sensor of range 200 DPI to 6000 DPI. It has 16.8m LED colour customization options and features six programmable buttons. You can purchase the device here. The Logitech G413 Backlit Mechanical Gaming Keyboard features the company's Romer-G mechanical switches. Logitech claims that this offers 25 percent faster actuation. Other features include brushed anodized aircraft-grade aluminium top case, USB passthrough port and precision key backlighting. You can buy the device here. Every gaming setup needs a good pair of cans for the exhilarating gaming music. The Electra V2 come with noise cancellation and a microphone and features an over the head design. You can purchase the device here.